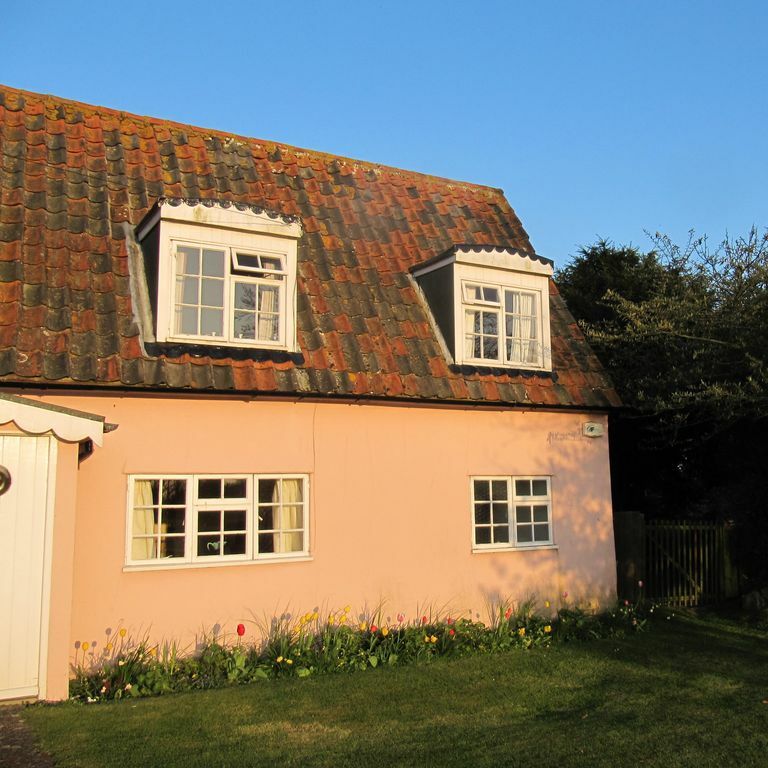 This charming country cottage is situated in the grounds of the owner's home in Wrabness on the Essex/Suffolk border. The cottage is warm and cosy with a wood burning stove in the lounge area. The Annexe was refurbished in April 2011 and has a new bathroom suite, flooring, tiling, new towels, bedding, crockery, cutlery, curtains and furniture. The property benefits from a comfy double bedroom, kitchen equipped with microwave, toaster, kettle, washing machine, oven/hob, fridge with freezer compartment, etc., bathroom (bath with over bath shower), lounge furnished with 2 x 2 seater, breakfast/dining table, television, DVD player, selection of DVD's, books and games, wood burning stove, entrance porch, garden (gated) with table and chairs and car parking. The main property has a small wood and an orchard and these can be explored. The Firs annexe dates back to the 1600's. The property is grade 2 listed and benefits from a wealth of period features. Children are welcome but please keep in mind the stairs are steep. Children's toys (including beach/outdoor) are available on request. The property has many period features and as a result some of the ceilings/doorways are low adding to it's charm and character. The village railway station gives very easy access to London (1 hour by train). Wrabness beach - approximately 20 minute walk/5 minute drive. Village shop - 15 minute walk/5 minute drive. Essex Way (along the beach). Manningtree - historic market town ( 5 miles). Harwich - historic port ( 15 minute drive). Harwich International Port (15 minute drive). Constable Country/Dedham Vale - 20 minute drive. Colchester - Englands oldest recorded town (30 minute drive). The Firs Annexe is on the main bus route between Harwich and Colchester (bus stop approximately 200 yards). Guests benefit from a pretty enclosed garden area, ideal for relaxing and enjoying a well earned rest. The amenities in the village include a well equipped village shop, train station and bus route with the beach and woods to explore all within walking distance. Many historic properties, tourist attractions, national trust attractions, Suffolk/Essex coastlines and scenic countryside are very close by. This is a beautiful area to visit and a perfect way to enjoy the English Countryside at it's best. The bathroom was refurbished in April 2011 providing a new bath (with over bath shower), toilet and wash basin. New flooring was also provided and the room freshly decorated. New towels/bathmats have also been provided. The kitchen has been refurbished (April 2011) and has been fitted with an oven/4 ring hob, fridge (with freezer box), microwave, toaster, kettle, washing machine and all cutlery/cooking utensils that could be required. A high chair is available on request. We made this our home, for 3 weeks, whilst our new property was being built. The cottage was warm and well equipped for our needs. The downstairs ceilings are low, but this added to the quaintness of the property. We made use of the local Community Shop and the railway station in Wrabness. Although, we know the area well, we discovered new footpaths in the locality. The owners made us feel very welcome, with flowers and a lovely card. There was ample safe parking on site for both of our cars. Thank you so much for your kind comments. We were very pleased to have you to stay. We wish you both lots of happiness in your new home. Quaint but comfortable. You might need some head protection. Comfortable bed, well equipped and clean. This is annexe to main cottage, in a lovely setting. All fixtures and fittings akin with this type of property. Really enjoyed our stay and would thank host, Rachael for all info and letting us stay in her home at short notice. Thank you so much for your kind comments. We're very pleased you enjoyed your stay. Lovely cottage exactly as described with low beams 😊�. Great area for walking and exploring. Nick and Rachel could not do more to make your stay perfect. Thanks we will rerurn. This cottage is very old and was built during the time when humans were very short. I am over 6 foot and my wife is just under 6 ft. The lounge area is very comfortable and roomy and we spent most of our time there. The bedroom is upstairs and again was very comfortable and all that you would need. The stairs up to the bedroom are quite steep. However, the entrance way, the kitchen, and the bathroom are very low and we bumped our heads on the large wood rafters many times. It is impossible for a man of my size to take a shower - and I had my first bath in more than 20 years. My wife and I had to walk around bent over all the time in the kitchen and bathroom. The cottage should note that these rooms are very low with some sort of height limits for future guests. The kitchen equipment was very basic and quite old with limited, if any, information. Unlike the majority of VRBO owners, there were no "extras" provided (milk, coffee etc.) for our arrival. The owners did kindly allow us to check in quite early as we had just arrived from the States. The location is great - very close to Harwich and just a short drive to "Constable Country". The local walks were also excellent. Thank you for your comments. It is always helpful to receive feedback so we can make appropriate changes and to hear what our guests have enjoyed. Thank you for your very kind comments Helen. We are very pleased you had another happy stay and had good weather for this stay too. Best Wishes. Wrabness is a traditional English village situated on the Essex/Suffolk border, which is located on the Stour River Estuary which forms part of of Constable Country. Wrabness benefits from its own beach, a RSPB nature reserve, Wrabness woods, a village shop, rail (70 minutes from London) and bus links to local towns. The historic international port of Harwich. The historic market town of Manningtree (England's smallest recorded town). Colchester ( England's oldest recorded town). Flatford Mill / Dedham Vale. Changeover day is flexible. Please contact the owner to discuss your requirements. A deposit of 30% of the total rent is required to secure your booking with the full balance of your rent being due 4 weeks before your holiday starts.